Dilwar is aged 5 and attends Elashkhandi School Under the Sky. He has one sister who is two years old. 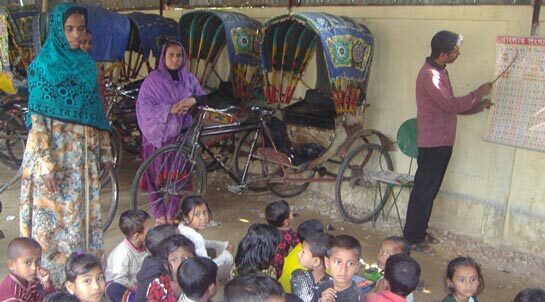 Dilwar’s father is a rickshaw puller who came to Sylhet 5 years ago from another district of Bangladesh, Mymensingh. His father is one of 4 brothers and 5 sisters in Mymensingh. All his brothers are farmers and all his sisters are married. 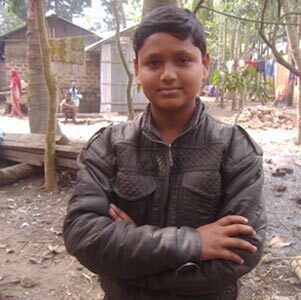 Dilwar’s father came to Sylhet because he was not earning enough money as a farmer. He studied to class 8 in school but can only read a little. Dilwar’s mother comes from Sunamganj. She did not go to school and cannot read or write. She came to Sylhet 7 years ago with her father who moved to the town for work. Her father died 5 years ago. She has one brother who is also a rickshaw puller and two sisters. Dilwar’s mother does house work in the houses of other people. The family lives in one room that is made of bamboo. They share a tube well and outside toilet with many other families. Dilwar wants to go to Khasdobir primary school and in one years time his sister will start attending Elashkhandi School Under the Sky. Mohammed is 11 years old. He attended Badambagicha 3 School under the Sky and then went to Khasdobir Primary School where he studied to class 5. He is now in Class 6 at Aided School. He regularly attended Badambagicha SUS and enjoyed learning there. He has two sisters – one is studying in school and his younger sister also attended Badambagicha School Under the Sky. His mother is a housewife and works in the family home. His father is a plasterer. The family of 5 live in one room close to Badambagicha School Under the Sky. When he grows up he wants to become a policeman.